Finished sixth at the Sun Belt Indoor Track and Field Championships running 56.38 in the 400m after running a 56.34 to finish second in the 400m preliminary … Finished third in the 4x400m team ending with a time of 3:47.05 … Ran a personal best of 8.08 in the 60m preliminary at the Chipotle Marshall Invitational … Finished second with a time of 57.17 in the 400m at the Chipotle Marshall Invitational … Competed in three events at the ASU Invitational running a 59.44 (400m), 27.01 (200m) and 3:57.18 (4x400m) … Finished fourth in the 4x400m (3:54.43) at the UAB Vulcan Invitational … Finished eighth in the 400m (59.75) and third in the 4x400m (3:57.43) at the David E.Walker Kickoff Classic … Kicked off the season at the BSC Panther Indoor Icebreaker running in the 400m (1:00.45) and 4x400m (4:08.10) … Placed third at the Sun Belt Outdoor Track and Field Championships in the 4x400m (3:43.04) … Ran a time of 56.39 in the 400m preliminary … Won the 400m with a personal best (55.81) and the 4x400m (3:46.04) at the Western Carolina University T&F Invitational … Recorded a personal best in the 200m (25.74) at the Tiger Track Classic … Placed third in the 400m (57.77) at the Jaguar Classic … Finished second in the 100m (12.44) and 200m (25.27) at the Lady Gamecock Quad Meet (JSU). 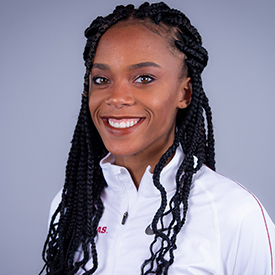 Her specialty was the 400m race where she clocked a best 56.19 time … Davis finished second in Gwinnett County, third in the region and fifth in the state meet (56.37) … Her best 400m indoor time was 58.50 … She was part of Grayson’s state championship 4x100m relay team (46.58) and second-place 4x400m relay squad (3:47.04 under coach Jason Abner … Davis also ran the 200m, with a best clocking of 25.28, edging her 25.33 and 25.35 times … She ran 26.06 indoors in that event … Her top 100m times were 12.51 and 12.59 seconds … Her best 60m time was 8.16. Born on Oct. 13, 1997 … Daughter of Bernard and Anessa Yates … Has one sister; Brittany … Majoring in journalism.